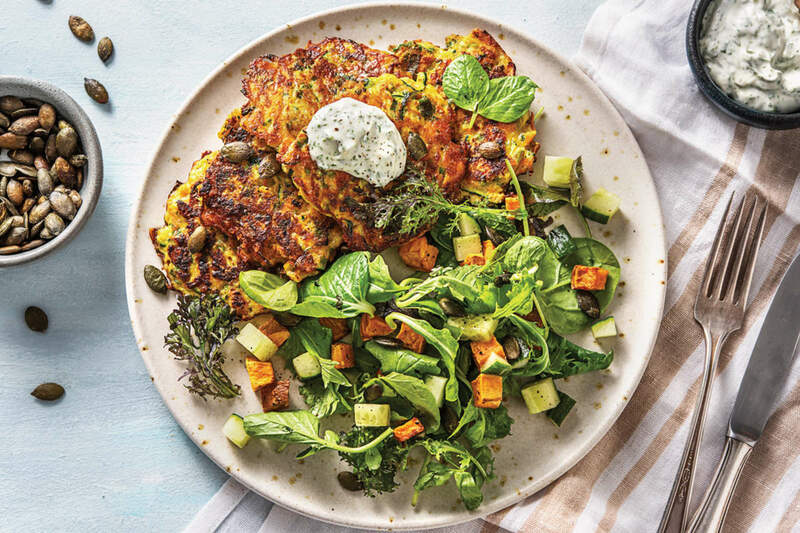 There's no better way to get your veggies than by adding them to cheesy golden fritters, gently fried for a gorgeous finish. With an extra dose of goodness from the robust side salad and a drizzle of delicious herby mayonnaise, this is a colourful garden medley that you'll love! While the kumara is roasting, grate the courgette. Place the courgette in a tea towel and squeeze out the excess moisture. Grate the carrot (unpeeled). Thinly slice the spring onion. Finely chop the chives. Heat a large frying pan over a medium-high heat. 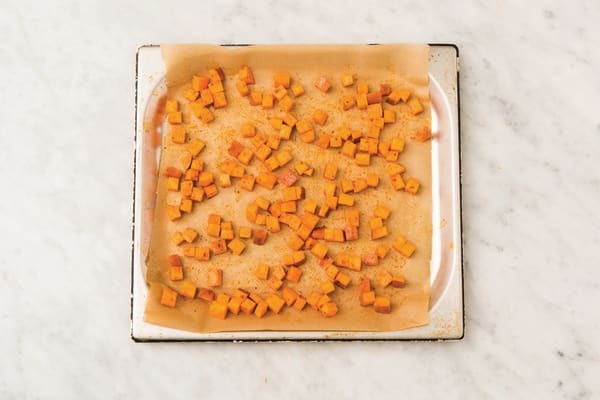 Add the pepitas and toast, stirring, for 3-4 minutes, or until lightly browned. Transfer to a small bowl. 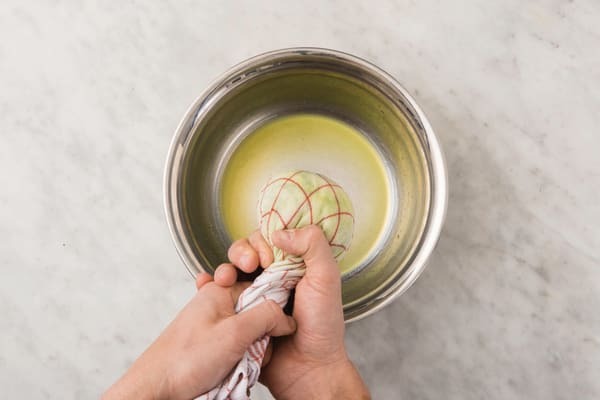 In a medium bowl, whisk the eggs. 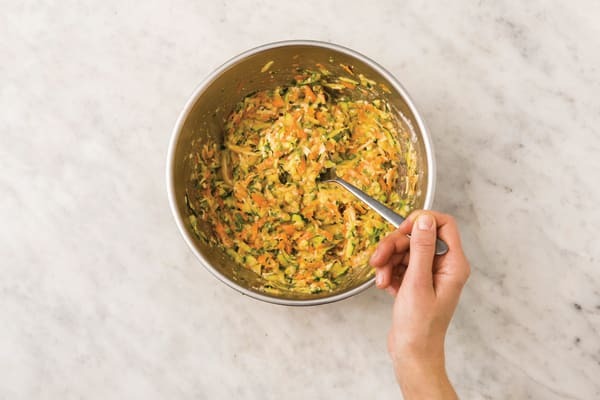 Add the courgette, carrot, spring onion, chives and shredded Cheddar cheese and stir well to combine. Add the plain flour, salt and a pinch of pepper. Mix well to combine. TIP: Lift out some of the mixture with a spoon, if it's too wet and doesn't hold its shape, add a little more flour! Return the frying pan to a medium-high heat and add enough olive oil to coat the base. When the oil is hot, add 1/4 cup of the fritter mixture and flatten with a spatula. Repeat with the remaining mixture (you should get 3 fritters per person.) TIP: If your pan is getting crowded, cook in batches for the best results. Cook for 3-4 minutes on each side, or until golden. Transfer to a plate lined with paper towel to drain. 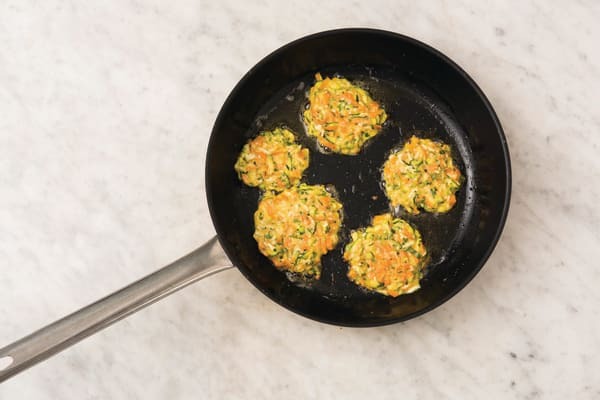 TIP: Don’t flip early to ensure the fritters can set and add extra oil as needed. Finely chop the cucumber. Cut the lemon into wedges. In a medium bowl, combine the honey, olive oil (1 tbs for 2 people / 2 tbs for 4 people) and a small squeeze of lemon juice. Season with a pinch of salt and pepper. 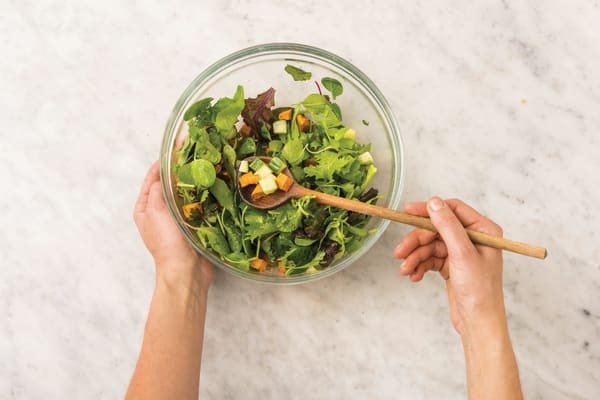 Add the cucumber, roasted kumara, mixed salad leaves and toasted pepitas to the bowl and toss to coat. 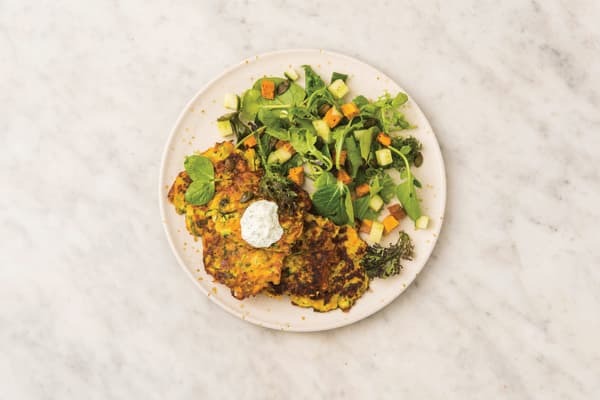 Divide the salad and fritters between plates. Serve with the dill & parsley mayonnaise and any remaining lemon wedges.